I had a conversation with someone recently and mentioned my interest in data analysis and who I intended to learn the necessary skills and tools. They suggested to me that while it is great to learn the tools and build the skills there is little point in doing so unless i have specialized knowledge in a specific field. They basically summed it to that I'd just be like a builder with a pile of tools who could build a few wooden boxes and may be build better things (cabins, cupboards etc), but without knowledge in a specific field I'd never be a builder people would come to for a specific product. Has anyone found this or have any input on what to make of this ? It would seem if it was true one would have to learn the data science aspects of things and then learn a new field just to become specialized. On the one hand, you should really read his post. On the other hand, I can offer my own experience: my subject matter expertise (which I like better as a term than "Substantive Expertise", because you should really also have "Substantive Expertise" in math/stats and hacking) is in the retail business, my math/stats are forecasting and inferential statistics, and my hacking skills lie in R.
From this vantage point, I can talk to and understand retailers, and someone who doesn't have at least a passing knowledge of this field will have to face a steep learning curve in a project with retailers. As a side gig, I do statistics in psychology, and it's exactly the same there. And even with quite some knowledge of the hacking/math/stats part of the diagram, I would have a hard time getting up to speed in, say, credit scoring or some other new subject field. Once you have a certain amount of math/stats and hacking skills, it is much better to acquire a grounding in one or more subjects than in adding yet another programming language to your hacking skills, or yet another machine learning algorithm to your math/stats portfolio. After all, once you have a solid math/stats/hacking grounding, you could if need be learn such new tools from the web or from textbooks in a relative short time period. But the subject matter expertise, on the other hand, you will likely not be able to learn from scratch if you start from zero. And clients will rather work with some data scientist A who understands their specific field than with another data scientist B who first needs to learn the basics - even if B is better in math/stats/hacking. Of course, all this will also mean that you will never become an expert in either of the three fields. But that's fine, because you are a data scientist, not a programmer or a statistician or a subject matter expert. There will always be people in the three separate circles who you can learn from. 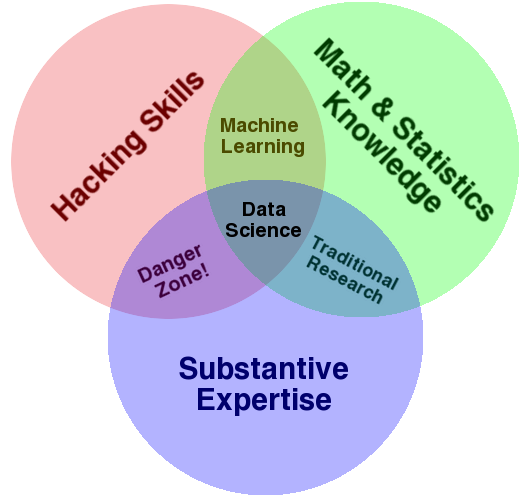 Which is part of what I like about data science. EDIT: A little while and a few thoughts later, I'd like to update this post with a new version of the diagram. I still think that Hacking Skills, Math & Statistics Knowledge and Substantive Expertise (shortened to "Programming", "Statistics" and "Business" for legibility) are important... but I think that the role of Communication is important, too. All the insights you derive by leveraging your hacking, stats and business expertise won't make a bit of a difference unless you can communicate them to people who may not have that unique blend of knowledge. You may need to explain your statistical insights to a business manager who needs to be convinced to spend money or change processes. Or to a programmer who doesn't think statistically. 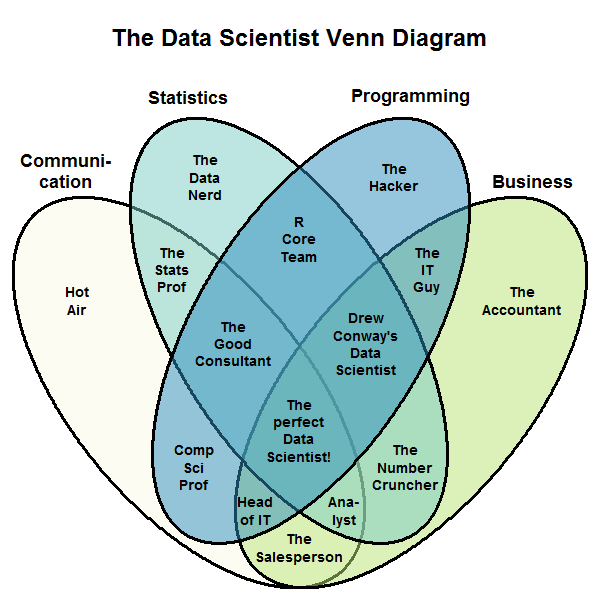 So here is the new data science Venn diagram, which also includes communication as one indispensable ingredient. I have labeled the areas in ways that should guarantee maximum flaming, while being easy to remember. Sure, you can. Companies are clamoring for data scientists. Be careful though that they all interpret the term differently. Depending on the company you might find yourself asked to do anything from statistics to writing production code. Either one is a full-time job in itself and you have to be prepared for both, so asking for deep specialized knowledge on top of that's not reasonable, in my opinion, and the companies I've talked to stressed the other two areas (esp. the programming). However, I found that it helps to be familiar with the types of problems that you might face. Depending on the sector, that could be anomaly detection, recommendation/personalization, prediction, record linkage, etc. These are things you can learn as examples at the same times as maths and programming. How deep should ones linear algebra knowledge be before starting data science?